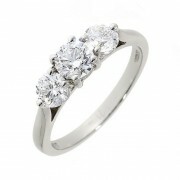 Diamond Three Stone Rings	There are 22 products. Three stone engagement rings, in platinum, white or yellow gold, signifying your past, your present and your bright new future. Our three stone diamond rings are set with three perfectly matched diamonds, selected by our award winning in-house FGA gemmologists and hand mounted in classic or contemporary engagement ring settings. Many more styles and loose stones available to view in store, or design your own engagement ring with our state of the art design service. Inspired by the classic lines seen on Oriental temples, the bars - or claws - on this Pagoda ring curve underneath the setting and leave the sides of the diamonds open to view. This ring features three round brilliant cut diamonds with a total weight of exactly half a carat but it can be ordered in alternative diamond weights and in all yellow gold. Inspired by the classic lines seen on Oriental temples, the bars - or claws - on this Pagoda ring curve underneath the setting and leave the sides of the diamonds open to view. 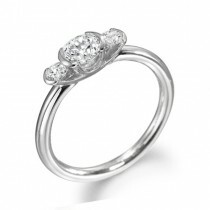 This ring features three round brilliant cut diamonds with a total weight of 0.45cts but it can be ordered in alternative diamond weights and in all yellow gold.